Emergency! iTunes and Windows Explorer won’t recognise your iPhone, iPod, or iPad. You’ve unplugged and replugged in the USB cable about a dozen times and it’s still not working, and at this point, you are now starting to search for answers. Good news, there is a solution. Bad news, it’s time consuming and involved. Problem is that your Windows computer and iTunes software have stopped talking to each other, and the iTunes drivers that allow them to communicate, are damaged. Many reasons can account for this happening, but the solution is same. The solution is to uninstall iTunes and re-install it. 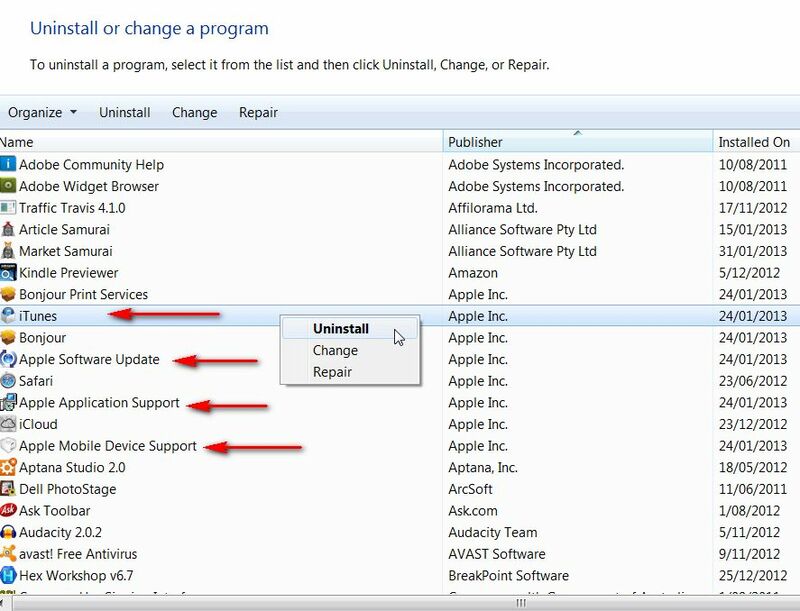 Don’t to try repair it using the repair feature of the uninstaller, it won’t work. Let’s use Windows Vista as the example. Important: Uninstalling these components in a different order, or only uninstalling some of these components may have unintended affects. Do not uninstall Bonjour (which is a requirement to reinstall iTunes)! If you do you will have to download Bonjour from the Apple website and install that first. Re-install iTunes and you will find that your device magically appears again, and you shouldn’t have any issues with finding your device in Windows Explorer either. This entry was posted in How To's, iPad, iPhone, iPod and tagged iPad, iPhone, iPod, iTunes, Windows Explorer. Bookmark the permalink.